Living on Earth, hosted by Steve Curwood, is Public Radio International’s weekly Environmental News Magazine. On November 30, 2018, it aired three long segments: Trump Climate Change Report, featuring John Holdren, Obama’s former science advisor; Saving the Sumatran Rhino, featuring freelance journalist Jeremy Hance, and New England’s Stone Walls, featuring Steve Curwood and I examining an abandoned 1755 farmstead in New Hampshire. The highlight of that 10-minute podcast is the recorded voice of Robert Frost reading his poem Mending Wall. Other topics include answers to the questions: Who built the walls? Why are they special habitats? Are humans part of their geology? Did wall help win the American Revolution? 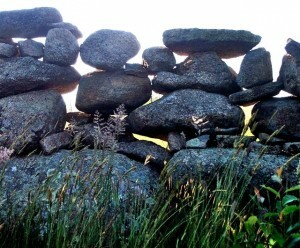 Above is a “pile” of well-stacked stone on a boulder somewhere in western New England. This activity would have helped clear a field or pasture. 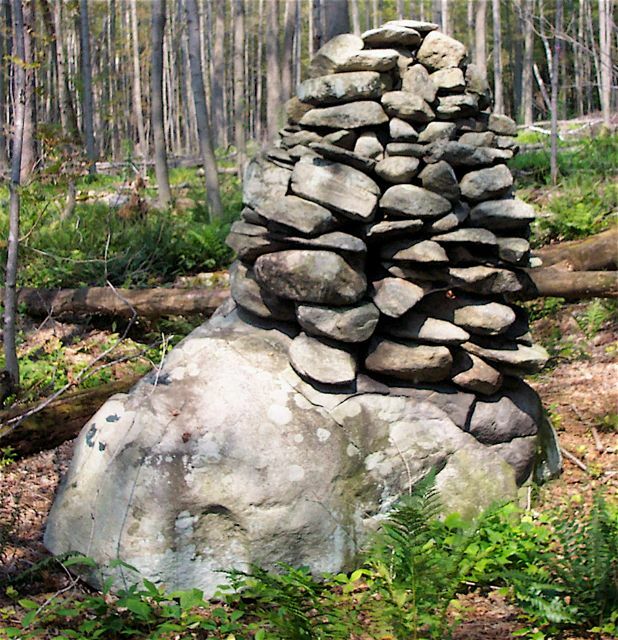 But more importantly, it turned the mundane act of clearing land into a stacking game, leaving cairns and stacks for us to puzzle over and misinterpret as sacred sites. Yesterday, I learned of a curious case of stonework performed by an elderly man with dementia. The anecdote, published in the Providence Journal for September 2, 1895, refers to a time “60 years ago,” which dates the case to the mid 1830s. 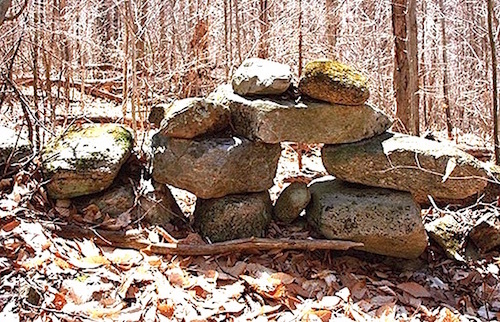 In this case, the stonework was done as “keep-busy” therapy for an aging farmer with dementia, a reason not usually cited as an explanation for odd stone structures found throughout New England. It is one of the few cases in my experience where the origin of stone structures –walls, piles, enclosures, cairns– is specifically documented in time, place, and purpose. The lesson here is that odd stone structures need not be expedient or symbolically sacred. Unless proven otherwise, those dating to before and after European contact might reflect little more than individualistic, idiosyncratic responses to behavioral cues. The stones remain as a testament to dementia, a condition that plagues millions of adults today, and to the value of stonework in happily passing the time as a form of engagement with the world, even when one’s mind is slip sliding away. I know this condition from direct experience because my own 96-year old father has it today. Being a former band conductor, he physically directs the musical memories floating through his mind. Another resident of his managed care facility knits while she walks, again a response to the urge to do something physical. Had my father been the farmer’s uncle from 19th century New England, however, he might have felt the urge to stack stone to occupy his mind to pass the time away. My favorite aspect of this story is that the micro-history of this demented builder faded away in only six decades. Cultural memory and individual memory both fade away, leaving archaeology to fill in the gaps. NOTE: This anecdote is based on an excerpt sent to me by Dr. Tim Ives, the Rhode Island state archaeologist. The original is below the line. Note that the location is given as “northwestern” Connecticut when it is almost certainly “northeastern,” an easy mistake to make by the author. The Anthropocene is the epoch of geological time we are currently living in, a discrete interval of Earth history during which the collective actions of a single species —Homo sapiens— is the dominant geological agency operating on our planet. Though the “epoch” is not yet an official “Epoch” (owing to international debate over the date of its lower boundary), there’s no doubt that we’re in the thick of it. The preceding epoch, the Holocene, contained the bulk of the present interglacial epoch when the human agency was less impactful. For New England stone walls, the Anthropocene onset dates to 1607, when the first wall was built by the first English colony at Popham Point, Maine. Philosophically, the key idea for me is that, in the woods of New England, the main Anthropocene impact is already past and was generally positive in diversifying the landscape and leaving archaeological ruins that enhance our lives. 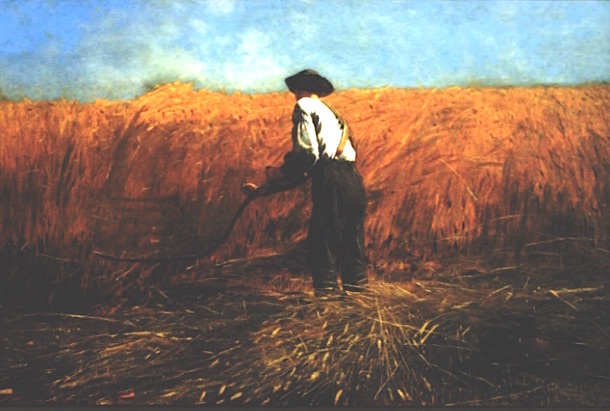 “The Veteran and a New Field,” by Winslow Homer (1865), selected from the Metropolitan Museum of Art as the cover Illustration for Donald Hall’s memoir “Life Work” (Beacon Press, 2003). Why this mention of Donald Hall on the SWI website? Because –more than anyone else except Robert Frost — he helped me understand what the rural New England psyche was all about, and why it’s so tightly tied to fieldstone walls. He did so for me neither in person nor poetry, but in his literary nonfiction. I treasure my signed copies of his books, and my memory of when he signed them. I write this post on the occasion of his very recent death on June 23, 2018 at the age of 89, the end of a flesh-and-blood life summarized by his obituary in the New York Times. Why this image of a flat, stone-free, warm, highly productive field? Because it’s everything that Hall’s outdoor prose was not, offering a well-deserved rest from the hilly, hardscrabble, colder, and tougher landscape of his actual life, as exemplified by this passage from Seasons at Eagle Pond, a collection of essays written from his family farmhouse on New Hampshire’s Grafton Turnpike, and published in 1987 by Houghton Mifflin. And although we may regret the darkening day, the beauty of late autumn is real and serious. With the leaves down, granite emerges from the hills, and everywhere we see again the hill’s true shape and the stonewalls that the ancestors built—to enclose their animals and to clear their fields of rocks—making gray rectangles on the gray hillsides. Even today, the culture of the North Country derives from people who moved inland from coastal cities to wilderness late in the eighteenth century. The veterans and families who headed for the lonely north selected themselves to work harder than their brothers and sisters, with less comfort, in return or independence. Six Keniston brothers fought in the Revolution, one of them my great-grandfather Ben’s grandfather. They grew up outside Boston and after the war scattered north along with thousands of their fellow veterans to the woodlands of new Hampshire and Maine and what would become Vermont. Paul Fenton’s ox-cart man brought the dream of liberty north after the Revolution. This independence was not so much the abstraction of the Declaration – lofty, glorious, and Frenchified – as it was a dream whereby the single unit of a family could exist in benign anarchy without regulation or cooperation. The liberty boys wanted each man his own nation, little city-states in the hills, small valleys dividing narrow units separated from each other by granite. Separateness from others was not a price to pay but a reward to win. Settlers built rudimentary houses while they cleared ancient trees and moved rocks, making stonewalls. Because each family settlement required about forty acres for survival, they could not be crowded. They would never acquire one or save it, but they would contrive their own comfort. The natural world provided wood for warmth and ice for chilling; add a great garden, with a root cellar for storing apples, potatoes, squash, cabbage, carrots, turnips; add one cow; add deer and turkey shot in the wild, sheep for shearing, maybe flax grown to make linen, bees and sugarbush for sweetness. In this society, men worked in woods and fields while women labored inside at ten thousand tasks. Notions of self-sufficiency became a brief reality—which still creates New England character, in the endurance of its superannuated dream. 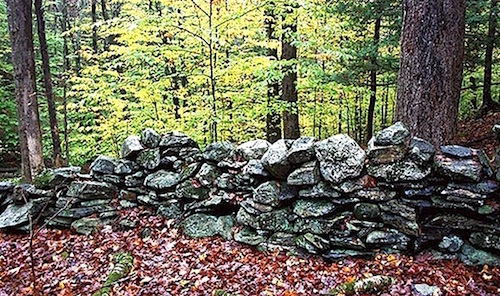 “Stone wall, with moss, Putney, Vermont,” by Anna Kusmer. 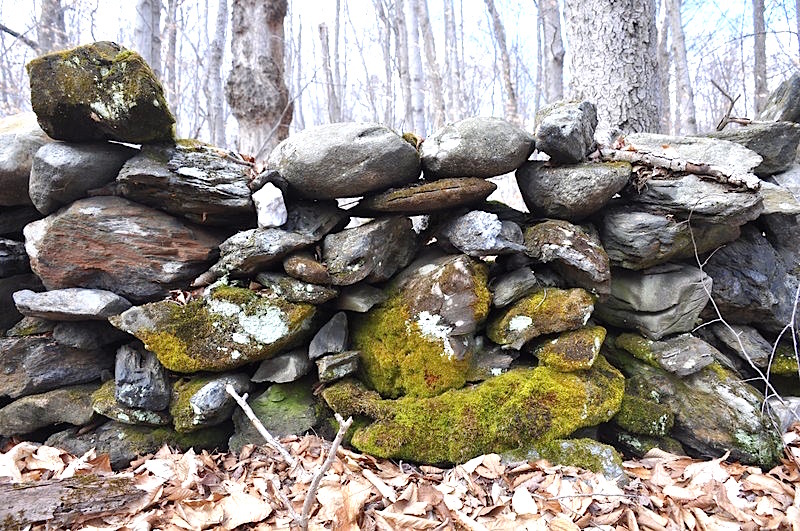 Earlier this spring, Anna Kusmer, working on an AAAS (American Association for the Advance of Science) science writing fellowship, interviewed me for a story about New England’s fieldstone walls for the internationally popular website Atlas Obscura. Their “mission is to inspire wonder and curiosity about the incredible world we all share.” Her piece, titled New England is Crisscrossed with Thousands of Miles of Stone Walls, nicely summarizes the continuing fascination we have for these old walls, and the work of the Stone Wall Initiative in helping to appreciate and conserve them. To help share her work, I reproduce her lead image. Drawing by Adelaide Tyrol for Northern Woodlands Magazine, March 18, 2018. 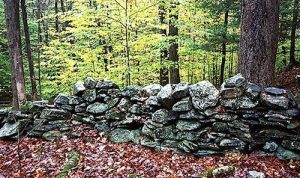 On two recent occasions, I was interviewed by Joe Rankin for two articles on stone walls for Northeast Woodlands magazine. The first was about the creatures inhabiting stone walls. The second was a Q&A on curious facts about stone walls. Below are a few key illustrations with detailed captions. I found both articles very interesting and nicely done. The links are embedded in the descriptions above. Below are two photos with captions that I sent (and they edited) for the second article. I share them here because they show a remarkable contrast between two of New England’s “wild walls” (not mason-built or maintained), and help illustrate how the precise technical (but not esoteric) language of my classification (Exploring Stone Walls, Walker, 2005) can help us understand the phenomenon more richly. Stone walls are landforms. In fact, they are signature landforms, defining our region as do the lakes of Minnesota, the caverns of central Appalachia, the canyons of the Southwest, and the volcanoes of the Northwest. Indeed, we live in the Anthropocene epoch, in which human beings are the dominant agency on the planet. One of the things we do is move mass from one place to another at a greater average rate than did the glaciers during the ice age, a previous epoch. The stone walls are the most widespread an ubiquitous indicator of our power. Stone walls reveal that we are part of nature. Prior to the age of fossil fuels, the mass moved by muscle power is so monumental, the geographic pattern so widespread, and the style so uniform that we must concede that New England’s stone walls emerged naturally as a consequence of the conversion of forest to farm. Above this “natural” expression of agroecology is the cultural gloss. Thus, walls are more analogous to the dam’s of beavers than to the fortress walls of castles. They are “artifacts” arising from an ecological imperative. 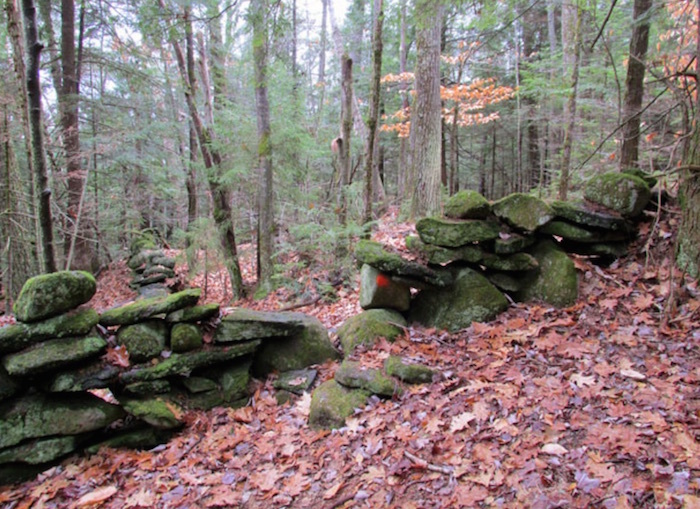 At the peak, there were about 250,000 miles of stone wall in New England, based on historic inventories by Robert Thorson (Stone by Stone) and on statistical predictions based on LiDAR mapping in southern New England by a team from the University of Connecticut . The average height of a stone wall is indeed “thigh high,” as Thorson claimed based on the anecdotal evidence of thousands of walls. This average wall was confirmed by Johnson and Ouimet’s statistical analysis to be 0.76 ± 0.23 m high and 0.96 ± 0.50 m wide. Prior to the Gilded Age (of outside money), most walls were built on farms one segment at a time by people from those farms and with resources coming from those farms. During and after the Gilded Age, many of the original walls were built (upgraded) as capital improvements by expert laborers (masons) paid for with money coming from urban and industrial wealth. 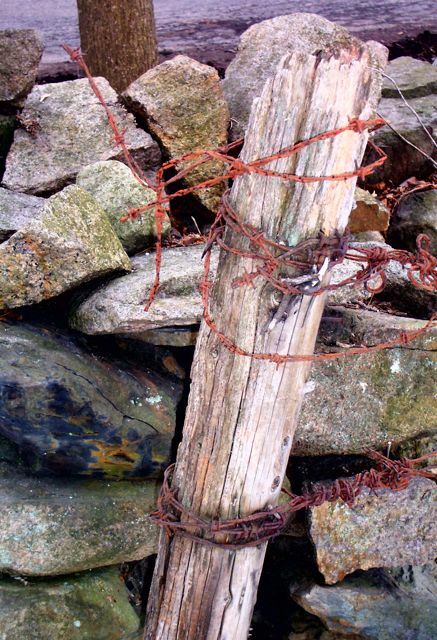 The oldest documented stone wall in New England was built in 1607 by English residents of a “Virginia” colony at Sagadahoc, Maine, now known as Popham Point, located at the mouth of the Kennebec River, Maine. A letter describing that site from the 1620s described “Rootes and Garden Hearbes and some old Walls” left behind after that one-year attempt at colonization failed . Footnote 2. This quote is from Thorson, Stone by Stone (New York: Walker & Co., p. 77), adapted from historian Howard Russell’s The Long Deep Furrow (Hanover, NH: University Press of New England, 1976, p. 9). Photo: Lace wall in Chilmark, Martha’s Vineyard, MA. “Ralph Wheelock’s Farm.” Francis Alexander (American, 1800-1880), c. 1822, oil on canvas, 122 x 64 cm. National Gallery of Art. Gift of Edgar William and Berenice Chrysler Garbisch, 1965. I was so stunned by the match between this painting and my text that I immediately began to write this post, which asked if some reader “out there” could provenance the painting. Paul Barnett responded, and I thank him for that. When acquired by its first known owner, Colonel Garbisch, the painting was originally named “Dennison Hall, Surbridge, MA.” Subsequent research revealed that there was no such place, but there was a Dennison Hill in nearby Southbridge, MA that looked like the painting, complete with a white house built in 1765 by captain Ralph Wheelock. Hence the painting was twice retitled, first to “Dennison Hill, Southbridge” and then to “Ralph Wheelock’s Farm,” based on information published in “American Native Painting” by the National Gallery of Art based on research by Arthur Kingston Wheelock, dated June 2000. So, when viewing the photo at the National Gallery of Art (linked here), I ask that you contemplate the match between the picture and the ~1000-word text. Travels in New England and New York (1815) by the Reverend Timothy Dwight is arguably the most widely read and appreciated overview of New England scenery during the years of the new republic. Here’s what Dwight –the widely traveled president of Yale College– had this to say about the soils beneath the fertile uplands of his southern New England landscape. The hills of this country and of New England at large, are perfectly suited to the production of grass. They are moist to their summits. Water is everywhere found on them at a less depth than in the valleys or on the plains. I attribute the peculiar moisture of these grounds to the stratum lying immediately under the soil, which throughout a great part of this country is what is here called the hardpan. His summary links the words: hill, grass, moist, stratum, soil, and finally, hardpan. Reordering these words as narrative, we get: hill, stratum, hardpan, summits, soil, moist, and grass. Here’s my geological explanation of Rev. Timothy Dwight’s summary. During the last glaciation, the hills of southern New England were high enough to be fairly resistant to glacial erosion. This led to the preservation of an older stratum of hardpan (technically, a lodgment till) beneath the broad summits. Though stones are present, this material easily disaggregates to create a highly fertile, loamy mineral soil, yet remains moist because it is impervious to rain and snowmelt percolating downward. The combination of high fertility and high moisture is perfect for the production of grass, New England’s historically most important crop, whether grazed a pasture and cut for hay. For this reason, the hilltops were sought after, their stones easily moved downhill and stacked into walls. Now here’s the longer quote from Stone by Stone explaining why this material was so sought-after. Lodgment till was a gift to the pioneers, with or without the stones. It provided a physical barrier that blocked the seepage into the earth of rainfall and snowmelt. This kept the soils moist, gave rise to perennial springs, and trapped the water in small ponds needed to water livestock. 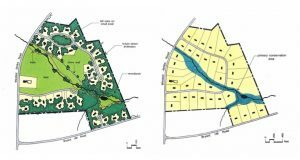 Agricultural soils developed on lodgment till were highly fertile because they were composed of microscopic pieces of glacially pulverized minerals that provided an enormous surface area for biological reactions in the soil, especially those that feed nutrients to plant roots. Lodgment till also produced a terrain of smoothly rolling hills that were usually steep enough to let the water drain away, yet gentle enough to prevent surface gullying. Rock hard beneath the surface, lodgment till was strong enough to support the largest barns. Finally, the gently rolling till-covered landscapes allowed easy movement of humans and their creatures because there was little need to build bridges or avoid rock crags. In short, my summary reads: “Lodgment till is almost singlehandedly responsible for rural New England’s bucolic image–gracefully curved hillside pastures framed by stone walls.” This is the material that lies beneath the canvas of Francis Alexander’s 1822 painting Ralph Wheelock’s Farm, and beneath the New England psyche as well. 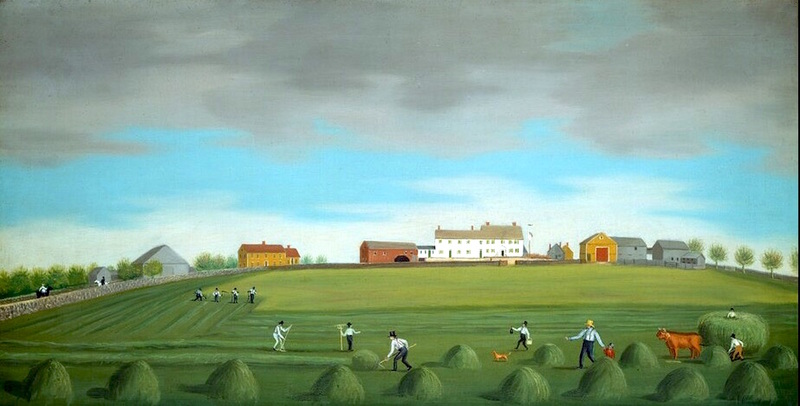 Perhaps that is why this painting was chosen by Yale’s Agrarian Studies shows for its home page. It’s nice to know that stone walls are increasingly being retained within subdivision designs, rather than obliterated as being in the way. In this quick post, I relay (with permission) a particularly eloquent paragraph by Randall Arendt, from a chapter titled “Protecting Natural and Historic Resources through Conservation Design” within his 2009 book Envisioning Better Communities. I have boldfaced words and phrases that are particularly critical to the mission of the Stone Wall Initiative. 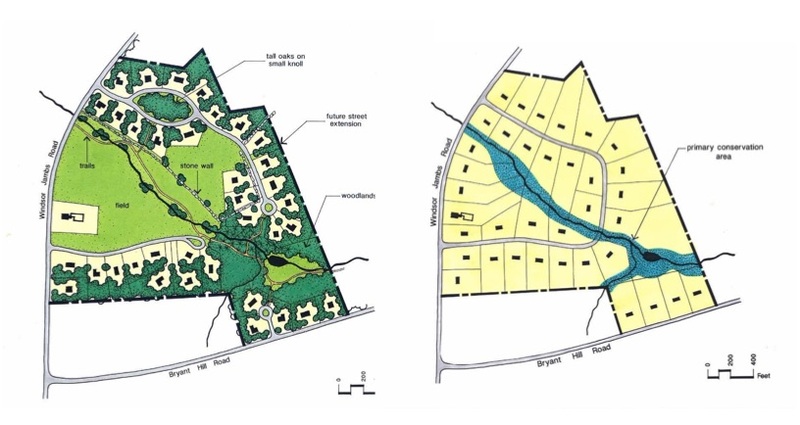 The pair of his drawings above show: to the left, a subdivision layout conserving and highlighting the historic features; and to the right, a traditional layout where lot size is maximized at the expense of the historic landscape. Which would you rather live in? For more information, visit Arendt’s website Greener Prospects. The SWI extends its congratulations to the Historical Society of Glastonbury, CT for raising funds to save and restore the stone walls of Hopewell Mills, located on Roaring Brook. For the full story, consult the July 6 story in the Hartford Courant. Such mills are testimony to the adaptability and innovation of America’s energy use. Fully ten percent of America’s energy now comes from renewables, ethanol are on the wane, nuclear is being re-thought, fossil fuels are slowly being phased out, and hydropower has fallen into the shadows. Building them required stone, and lots of it. Hence, stone walls played an critical role in America’s energy policy, especially in the decades prior to the Civil War. However, there was a time in American history when hydropower was king, and when manufacturing was totally dependent on it. 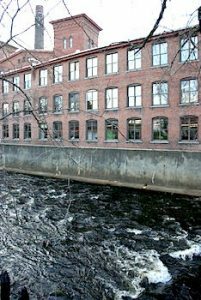 Largest was in Lowell, Massachusetts where “the controlled flow of water turned 31 mills, 6,300 looms, and 225,000 thread spindles” in a city created at a hydropower site on the Merrimack River. * Even there, in the rush to embrace coal, those plants turned to steam and let the water go by. Eventually most of these mills closed as America’s energy policy moved towards coal, and then petroleum, and now gas. Such mills nucleated communities all across America, concentrating people, especially recent immigrant workers, in ways that would not be repeated again. *Quote from my recent book, The Boatman (Cambridge, MA: Harvard Press, 2014), 214. This sources Theodore Steinberg’s Nature Incorporated: Industrialization and the Waters of New England (New York: Cambridge University Press, 1991). The photo above is from Maynard, MA.